The distribution centre has 61 loading gates for incoming and outgoing goods. It enables increased capacity with up to 20,000 packages to be shipped per day. Some 300 employees work to ensure everything runs smoothly. 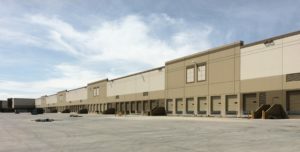 “We now operate a total of 1,600,000 square feet of warehouse space for our high-tech customer in this network. At all three sites we work with the same standards, processes, and interfaces, all of which run on the same IT setup,” said Mitat Aydindag, managing director of Arvato SCM Solutions for North America and Brazil.